Several sets of dual thermo-responsive diblock copolymers were prepared by consecutive reversible addition-fragmentation chain transfer (RAFT) polymerizations. While all copolymers contain poly(N-isopropylmethacrylamide) as non-ionic block that shows a coil-to-globule collapse transition of the lower critical solution temperature (LCST) type, the chemical structure of the second block, which is zwitterionic and belongs to the class of poly(sulfobetaine methacrylate)s, was varied systematically. In combination with the adjustment of the block sizes, its coil-to-globule collapse transition of the upper critical solution temperature (UCST) type can be fine-tuned. Due to the dual thermo-responsive behavior, the copolymers show a rich temperature-controlled self-assembly in aqueous solution. This was explored by turbidimetry, dynamic light scattering, as well as 1H NMR and fluorescence spectroscopies,. 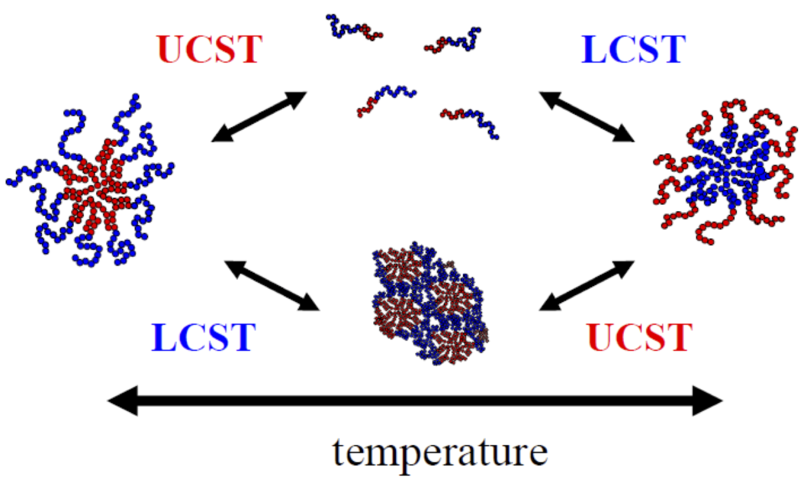 Depending on the relative positions of the UCST-type and LCST-type transition temperatures, various modes of stimulus-induced micellization are realized, including classical induced micellization due to a change from a double hydrophilic, or respectively, from a double hydrophobic to an amphiphilic state, as well as \\\\\\\"schizophrenic\\\\\\\" behavior, where the core- and shell-forming blocks exchange their roles.